Ring and small finger locking with trigger finger. Nonoperative treatment of stenosing tenosynovitis is more likely to be successful if initiated relatively early (eg, before 3 months). For information on surgical treatment of trigger finger that does not respond to conservative treatment, see Trigger Finger. A previous allergic reaction to some component of the planned injection is also a contraindication for steroid injection. Allergies to corticosteroids  and multiple local anesthetics  have been reported. 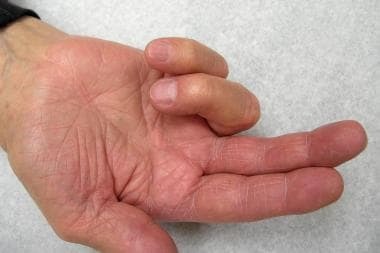 A patient who presents with diabetes and trigger finger may present a relative contraindication for offering a corticosteroid injection as the first-line treatment. Patients with diabetes who choose to undergo corticosteroid injection into the flexor tendon sheath must be educated about the effects of such injections on blood glucose levels. Wang and Hutchinson studied the effects of corticosteroid injection for trigger finger on blood glucose levels in diabetic patients and found that in all patients, blood glucose levels rose after injection; those with type I diabetes were most affected. The highest glucose level spike occurred the morning after injection, when average glucose levels were 72% higher than average preinjection levels. The palmar fascia consists of resistant fibrous tissue arranged in longitudinal, transverse, oblique, and vertical fibers. The longitudinal fibers originate at the wrist from the palmaris longus tendon, when present. These fibers spread out to the base of each digit, where minor fibers extend distally and attach to tissues. This arrangement of fibers forms the fibrous flexor sheath and pulley system of each digit. The A1 pulley arises from the palmar plate and proximal portion of the proximal phalanx, overlies the membranous sheath at the level of the metacarpophalangeal (MCP) joint, and is approximately 8 mm in width. For more information about the relevant anatomy, see Flexor Tendon Anatomy and Hand Anatomy. Ryzewicz M, Wolf JM. Trigger digits: principles, management, and complications. J Hand Surg Am. 2006 Jan. 31 (1):135-46. [Medline]. Lapidus PW, Guidotti FP. Stenosing tenovaginitis of the wrist and fingers. Clin Orthop Relat Res. 1972 Mar-Apr. 83:87-90. [Medline]. Nimigan AS, Ross DC, Gan BS. Steroid injections in the management of trigger fingers. Am J Phys Med Rehabil. 2006 Jan. 85 (1):36-43. [Medline]. Callegari L, Spanò E, Bini A, Valli F, Genovese E, Fugazzola C. Ultrasound-guided injection of a corticosteroid and hyaluronic acid: a potential new approach to the treatment of trigger finger. Drugs R D. 2011. 11 (2):137-45. [Medline]. Schubert C, Hui-Chou HG, See AP, Deune EG. Corticosteroid injection therapy for trigger finger or thumb: a retrospective review of 577 digits. Hand (N Y). 2013 Dec. 8 (4):439-44. [Medline]. [Full Text]. Liu DH, Tsai MW, Lin SH, Chou CL, Chiu JW, Chiang CC, et al. Ultrasound-Guided Hyaluronic Acid Injections for Trigger Finger: A Double-Blinded, Randomized Controlled Trial. Arch Phys Med Rehabil. 2015 Dec. 96 (12):2120-7. [Medline]. Golas AR, Marcus LR, Reiffel RS. Management of Stenosing Flexor Tenosynovitis: Maximizing Nonoperative Success without Increasing Morbidity. Plast Reconstr Surg. 2016 Feb. 137 (2):557-62. [Medline]. Wolfe SW. Tendinopathy. Wolfe SW, Hotchkiss RN, Pederson WC, Kozin SH, Cohen MS, eds. Green's Operative Hand Surgery. 7th ed. Philadelphia: Elsevier; 2017. Vol 2: 1904-25. Gutowski KA, Ochoa O, Adams WP Jr. Closed-catheter irrigation is as effective as open drainage for treatment of pyogenic flexor tenosynovitis. Ann Plast Surg. 2002 Oct. 49 (4):350-4. [Medline]. Isaksson M. Systemic contact allergy to corticosteroids revisited. Contact Dermatitis. 2007 Dec. 57 (6):386-8. [Medline]. Caron AB. Allergy to multiple local anesthetics. Allergy Asthma Proc. 2007 Sep-Oct. 28 (5):600-1. [Medline]. Baumgarten KM, Gerlach D, Boyer MI. Corticosteroid injection in diabetic patients with trigger finger. A prospective, randomized, controlled double-blinded study. J Bone Joint Surg Am. 2007 Dec. 89 (12):2604-11. [Medline]. Griggs SM, Weiss AP, Lane LB, Schwenker C, Akelman E, Sachar K. Treatment of trigger finger in patients with diabetes mellitus. J Hand Surg Am. 1995 Sep. 20 (5):787-9. [Medline]. Wang AA, Hutchinson DT. The effect of corticosteroid injection for trigger finger on blood glucose level in diabetic patients. J Hand Surg Am. 2006 Jul-Aug. 31 (6):979-81. [Medline]. Mifune Y, Inui A, Sakata R, Harada Y, Takase F, Kurosaka M, et al. High-resolution ultrasound in the diagnosis of trigger finger and evaluation of response to steroid injection. Skeletal Radiol. 2016 Dec. 45 (12):1661-1667. [Medline]. Murphy D, Failla JM, Koniuch MP. Steroid versus placebo injection for trigger finger. J Hand Surg Am. 1995 Jul. 20 (4):628-31. [Medline]. Taras JS, Raphael JS, Pan WT, Movagharnia F, Sotereanos DG. Corticosteroid injections for trigger digits: is intrasheath injection necessary?. J Hand Surg Am. 1998 Jul. 23 (4):717-22. [Medline]. Baack BR, Brown RE. Atypical mycobacterium soft-tissue infection of the dorsal radial wrist: a possible complication of steroid injection for de Quervain's disease. Ann Plast Surg. 1991 Jul. 27 (1):73-6. [Medline]. Taras JS, Iiams GJ, Gibbons M, Culp RW. Flexor pollicis longus rupture in a trigger thumb: a case report. J Hand Surg Am. 1995 Mar. 20 (2):276-7. [Medline]. Fitzgerald BT, Hofmeister EP, Fan RA, Thompson MA. Delayed flexor digitorum superficialis and profundus ruptures in a trigger finger after a steroid injection: a case report. J Hand Surg Am. 2005 May. 30 (3):479-82. [Medline]. Oh J, Jo L, Lee JI. Do not rush to return to sports after trigger finger injection. Am J Phys Med Rehabil. 2015 Apr. 94 (4):e26-30. [Medline]. Wong MW, Tang YN, Fu SC, Lee KM, Chan KM. Triamcinolone suppresses human tenocyte cellular activity and collagen synthesis. Clin Orthop Relat Res. 2004 Apr. 277-81. [Medline]. Akpinar S, Hersekli MA, Demirors H, Tandogan RN, Kayaselcuk F. Effects of methylprednisolone and betamethasone injections on the rotator cuff: an experimental study in rats. Adv Ther. 2002 Jul-Aug. 19 (4):194-201. [Medline]. Equipment needed for injection of digital flexor tendon sheath. Lidocaine and triamcinolone used for injection of digital flexor tendon sheath. Digital flexor injection. Needle is placed at 50º angle at base of finger flexion crease.